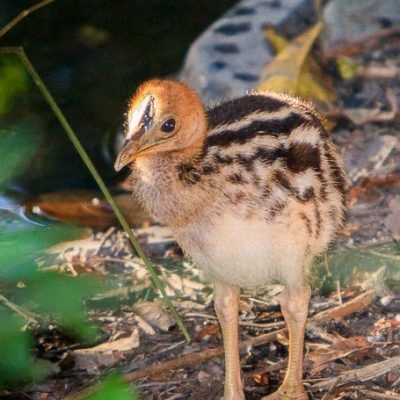 On October 2, 2014, in Queensland, Australia, BirdsInFocus reached a new milestone with 1,500 species. 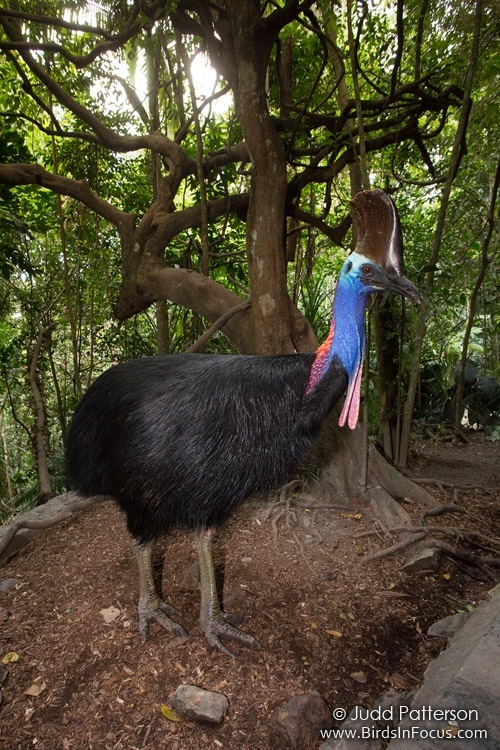 These photographs of Southern Cassowary were taken at Cassowary House, a private lodge nestled in dense rainforest near Kuranda. At the owners’ house, a variety of bowerbirds, honeyeaters, and birds-of-paradise visit feeders on a second-story balcony while larger ground-dwelling species stroll around the patio and terraces below. 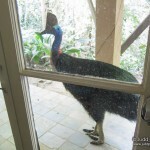 The local family of cassowaries include the house on their daily fruit tree circuit, and they are often treated to a few bananas by the owners. A male tending its downy chick (tiny for a cassowary, but already about a foot tall) gave us exhilarating views on our first day there, and the next morning the adult female also paid a lengthy visit, providing memorable opportunities to observe and photograph these amazing, flightless birds. 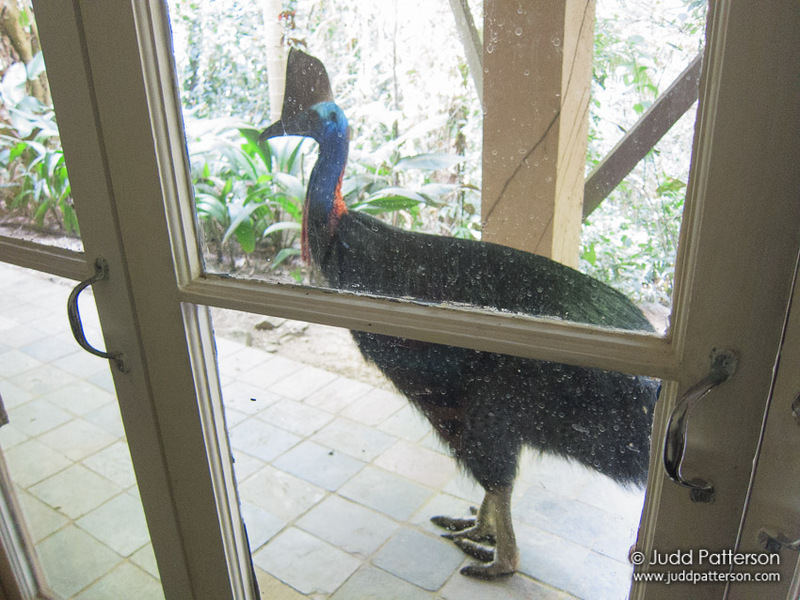 A surprise cassowary visit trapped Judd inside the safety room. 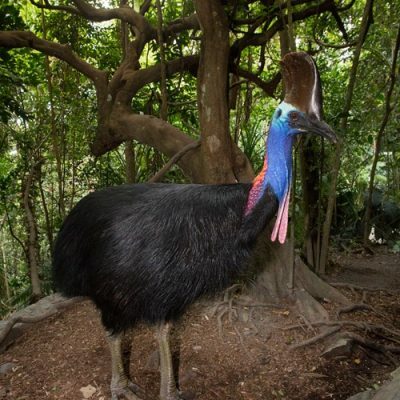 As the second largest bird in the world, the Southern Cassowary stands 5-6 feet tall and the female can weigh more than 130 pounds. Both David and Judd had the thrill of momentarily facing these birds at eye level before sounding the cassowary “alarm” and retreating to safer viewing locations. While attacks are rare, their menacing claws are not to be ignored. 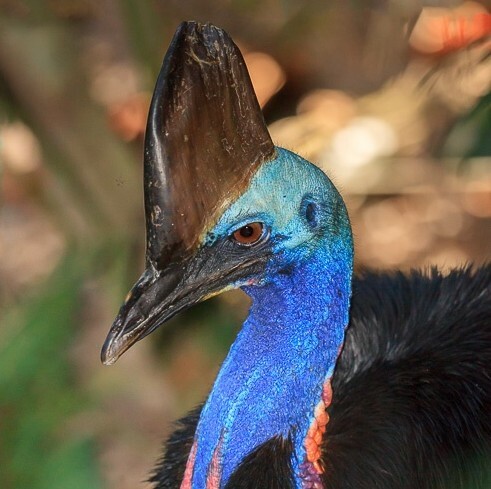 The male was much too aggressive to approach closely, but eventually we were all able to get down low with Missy, the female that has visited Cassowary House for more than 30 years. Rarely do we get the opportunity to travel together, but it is always a treat. On this adventure, all three of us spent two-and-a-half weeks in the tropical portions of Queensland and the Northern Territory. After Judd and David headed home, Bob and his wife, Mary, continued for seven more weeks on the Australian mainland and Tasmania. See more bird photos from this trip and David and Judd’s 2013 trip to Australia. 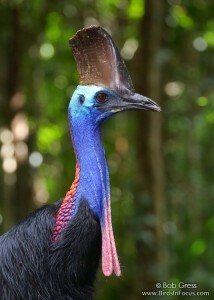 After these two trips, BirdsInFocus now has coverage of nearly half of the bird species of Australia!